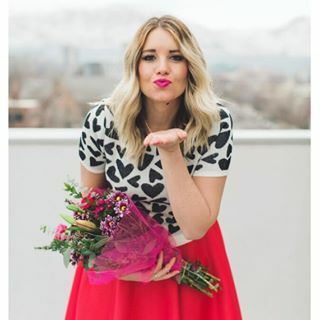 My name is Jalynn, you can call me Jalynn (inside joke guys, sheesh) and I am a Utah Fashion Blogger! I have a story behind who I am just like all of you. I will spare you the dirty deets and give you a few of the semi-important deets. :) I started The Red Closet Diary because fashion is one of my passions (I feel like I should start rapping after that sentence). I did not start blogging because I am a size 0 and everything looks good on me. I started blogging because I LOVE fashion. Most girls do, I know. Just like musicians are passionate about music, putting together (modest) outfits, being creative, and expressing my style is what I am passionate about. As you can see I dress different sometimes. I wear whatever I want depending on how I am feeling that day. I have my days where I want to be super girly, and I have my days where I want to wear all black and go the grunge route. I also have my "fat" days (aka weeks/months/all year... ugh) where I will refuse to wear anything but leggings. I am not famous, I am not a size 0 and I am not perfect (sorry guys). I am not trying to be perfect either, or see how much I can spend on one pair of shoes. I am a bargain shopping, little makeup, messy hair kinda gal. I just recently had a baby, her name is Charly. She is the coolest thing I have ever made. You will see her on my blog a lot. Sorry if you hate babies (jokes, who hates babies?)! If you have questions like my favorite color, and food, and my favorite movie (ya know the important stuff) you can just shoot me an email theredclosetdiary(at)gmail(dot)com or leave a comment! I hope you enjoy reading my blog as much as I have enjoyed doing it. I appreciate your comments and support more than you know! Thanks for stopping by!